Earlier this week, we made a special, one of a kind blended malt whisky while we were at the Glengoyne distillery. We tasted it and we’re very happy with it, and it’s utterly unique. 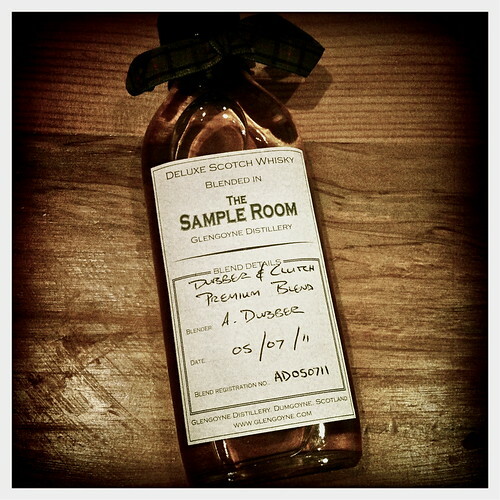 And this is it right here: the only bottle of Dubber and Clutch Premium Blend whisky in the world. We’d like to send it to you. All you have to do is tweet a link to this page, and you’re in the draw. We’ve made it exceptionally easy for you to do so as well. Over on the left of this page (scroll up a bit – you’ll see it), there’s a button that says ‘Tweet’. It’s blue. Found it? Click that, send out the message, and you’re done. Feel free to click that Like button while you’re up there as well – but that’s not one of the conditions of entry. We’ll draw the winner at random this time next week. Greetings Dubber and Clutch! I just discovered your blog — having searched for “whisky for beginners” or some such. My husband and I descend from Scotlan — and I from Ireland, Wales, England — so before we take our honeymoon to Scotland (after FOUR years of marriage!) we figured we’d better learn to drink whisky. This looks like a good place to get advice on that! Naturally I want that bottle of whisky you customized … but considering that I live in the U.S. even if I DID win the shipping would be out of this world. So I’ll content myself with reading your whisky-dramming adventures and hope the Bushnells gives us a good start. Slainte! Oh lordy, please don’t tell me I said BushNELLS when of course I meant BushMILLS! I’m such an amateur.